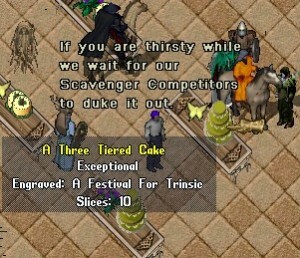 As the King’s bard, I eagerly accepted the invitation to the festival and dedication of the Trinsic memorial for Eliad and Luna. I recently reported to the King, the battle between the Traversis Emporium factions in Trinsic had ended. But the destruction and uncertainty had stopped trade to Trinsic. While many citizens lost family, homes, or jobs. After reviewing my reports, hoping to raise the spirits of the citizens, King Blackthorn proclaimed a day of celebration and reflection. Arriving I found that Agaris and Evidias had decorated the large dock patio with flowers and butterflies. Tables were set up with cakes and brew for everyone. Of course, I had to try both, which were delicious. 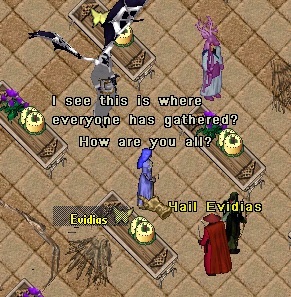 Waiting, for the arrival of Evidias, Lady Thalia of UMP held a scavenger hunt. Contestants were given a bag with two books. One with clues and the other for answers. Agaris and I peeked at the clues. We decided they were a bit hard for us, eating cake and drinking was much easier. An egg hunt was provided for those who didn’t go on the scavenger hunt. Eggs, with a clues, were hidden in the party area of the city. Still nibbling cake, I wandered around trying to find them. Before I could solve the message, the Scavenger hunters were recall to the party area and the winners announced. 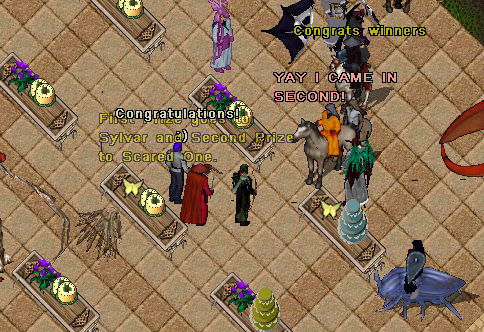 With cheers from all, Sylvar was awarded 1st place and Scared One was awarded 2nd place. 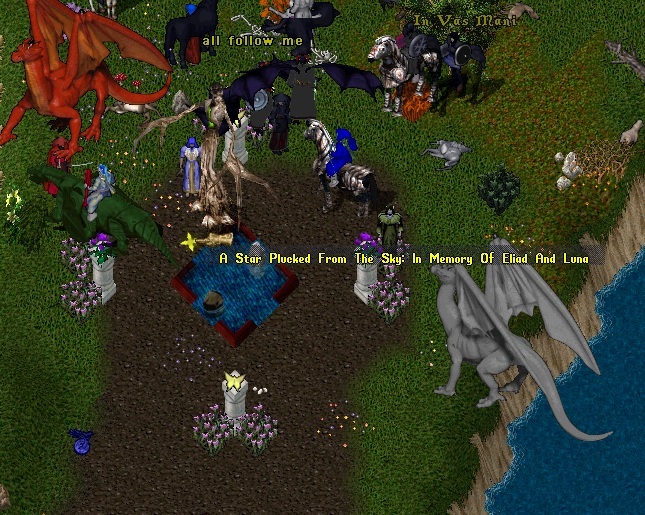 Besides prizes provided by Lady Thalia, both will have their names added to the Hall of Rewards. At last, Evidias arrived and lead us to the site of the memorial. Following her, I reflected on what I knew of Eliad and Luna. 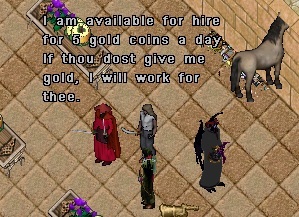 Evidias told a tale of pain and sorrow. 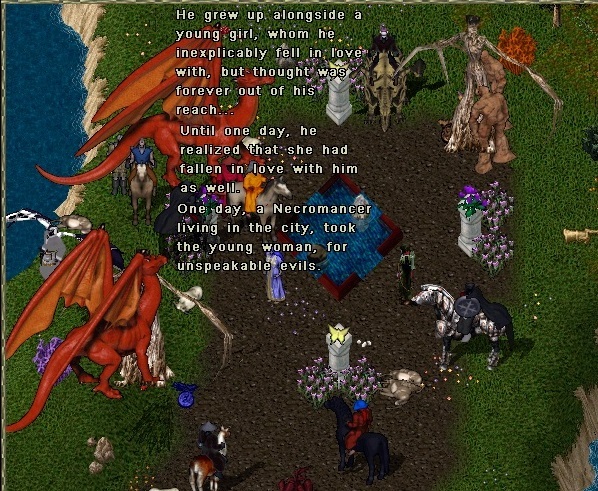 Eliad was so in love with Luna, that he was drawn in to the terrible plans of the Necromancers. 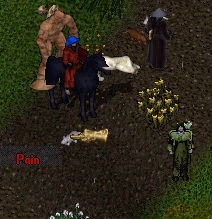 Luna became a pawn to bring back the greatest of Necromancer of all, Drudum. Little did I know the powerful magic in Evidias’ words. As she told the story, their sorrow and pain came to life and death began. 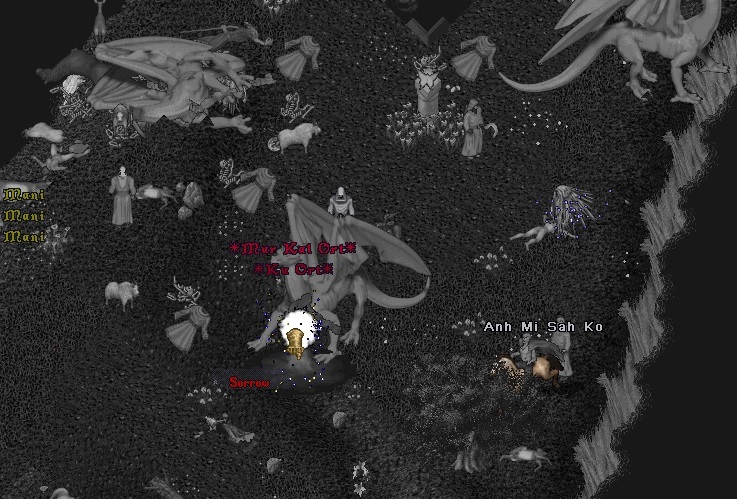 At last, lead by Evidias, the brave warriors and mages defeated sorrow and pain. The memorial was dedicated to forever remember Eliad and Lune’s love. Deep in thought, I wandered home, thinking of how I would report the events to the king. Already a song for the ages, was beginning to take form. A song of the quest, that love demands. Looking at the stars, I raised my glass toasting the power of love.